There is little question of whether or not prescription pain medication abuse is a legitimate concept. It most certainly is. The statistics on the subject are sobering to say the least. There is little debate on the subject to be had. However, on the subject of myths surrounding painkiller abuse, there are numerous examples to be found. When it comes to something like prescription pain medication abuse and addition, there is a lot of hard data to be found. At the same time, there are a number of “facts” out there that are flat-out untrue. Some of the myths that surround prescription pain killer abuse come out of misconceptions based on incomplete/untrue information. Others come out of assumptions that have no basis in reality. Regardless, one of the most common myths concerns withdrawal. There is the belief that if you need stronger dosages of your prescription, or if you experience withdrawal symptoms, you’re addicted. The issue here is an ability on the part of some to know the difference between dependence and addiction.There are myths out there, eager to be debunked to a significant degree. Another common misconception is that people can get addicted to painkillers and other drugs if they take them long enough. This is not true. Furthermore, responsible management of a treatment program has built-in safety nets to catch and deal with addiction. However, understanding this reality can in fact lead to a misconception of another kind. This would be the idea that since most people do not get addicted, you don’t have to worry about getting addicted either. 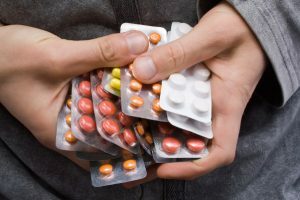 When you use your prescriptions as directed, and when you also make sure to report all responses to the medication to your doctor, you can avoid addiction easily enough. Failure to keep these things in mind is perhaps the most significant cause for why people become addicted. Communication with your healthcare provider is vital. One popular myth that certainly needs to die is the idea that because of the potential for addiction, it is better to remain in pain. This is a destructive thought, particularly since well-managed/monitored use of these prescriptions have proven themselves time and time again to be effective tools for pain management. Following doctor suggestions for pain management is vital towards recovery or improvement. This includes taking pills as suggested. It also certainly includes taking all of the pills as your doctor has directed you to take them. This is especially important with opiate painkillers such as codeine and co-codamol. These need close supervision by a doctor. So if you plan to buy these online, you need to choose a website with fully licensed and professional pharmacists and doctors in their team.